The following products can e.g. be filled: Dairy products like stirred and fruit yogurt, yogurt , cream, curd cheese, processed cheese; nearly all kinds of delicatessen and salads; soup and sauce pastes; dressing and sauces; mayonnaise; mustard; butter and margarine; spreads, honey, marmalade and jam; pâté; pet food; beauty creams; powders and jellies. For every product, we offer special dosing valves (e.g. rotary cutter filling valves for fibrous pet food, or piston dosing systems for very liquid products). Nearly all dosing systems can be executed with CIP / SIP. 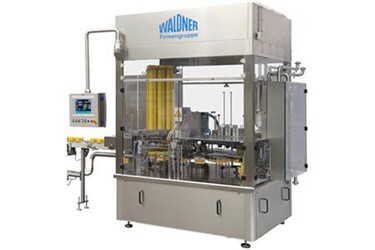 On our DOSOMAT Filling and Closing Machines, nearly all packaging materials can be run - we are able to run cups, tins and buckets, as well as closures made of carton, plastics, coex-material, aluminum, sheet steel or glass. Lifting of the cups out of the cup cells and push on a conveyor belt. Or forwarding of cups in a separate or integrated WALDNER End of Line Packaging Machine.